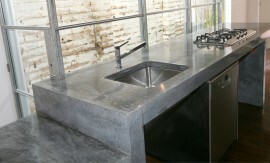 The Australia Street Warehouse conversion project rejuvenated a well used industrial concrete floor surface incorporating stunning architectural design and one of our largest to date concrete cantilever bench tops sweeping up from the polished concrete floor. 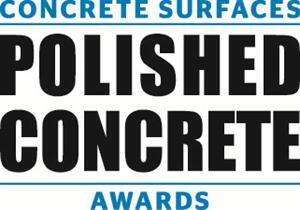 At 9 meters long overall,Â 1.2 meters wide with a 150-mm thick slab. 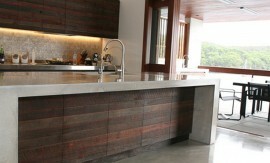 The Countertop curves up out of the floor at one end and is supported along its length by just three columns. The cupboards underneath were added after the concrete work was completed. 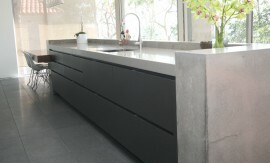 The end of the countertop extends past the last supporting column 2.4 metres. This end was built high so when the forms were removed, the cantilever settled back to level. It is tensioned by a 16-mm (0.64-inch) reinforcing cage tapering from the unsupported end through to the curve at the other end of the piece. The clientsâ son loves to come home from school and lie in the curve with his dog to cool off in summer. The clients spread their papers out on a Sunday morning while enjoying a leisurely breakfast. The piece was built in an old car assembly factory, and renovated, among other things, into this luxurious residence. The project was featured last year in Le Plus Beaux Interiors, a magazine published in France. The counter was featured on the magazineâs cover. The old existing concrete factory floor was ground and polished as well as building the bench. And yes, the car lives where it is in the photo. It was not placed there for the shoot. 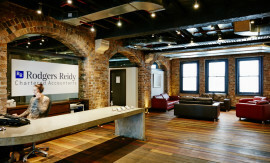 Echoing the strong parallel lines of the warehouse conversion located in Chippendale. 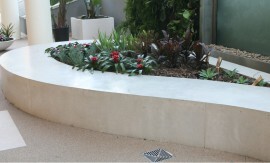 Soft lines offer a place of quiet reflection echoed through the teardrop planters. 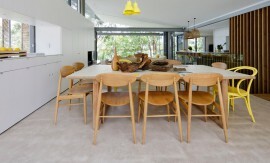 Ocean views framed by Concrete Floors and Feature Timber. 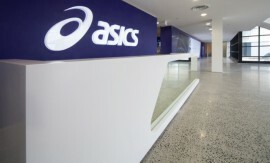 Asics headquarters high exposure Polished Concrete Floor. 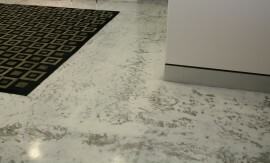 Fine Orthodontics wanted a floor that utilised the existing concrete surface with a refined twist. 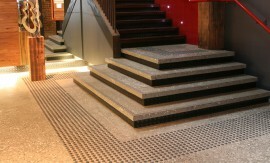 Intricate detail in stair tread design and integrated non slip feature pattern. 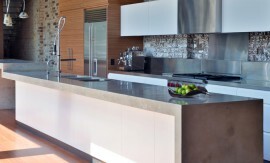 A Concrete Island benchtop should be the heart of every house. The Hearth levitates effortless above Australian Hardwood Floors. Make a bold statement with Concrete Flooring. 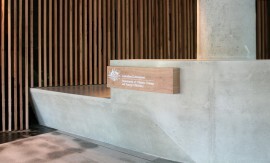 Concrete Reception Desk - The Department of Climate Change & Energy Efficiency.